Coriander is one of those herbs that can evoke a strong reaction. Here’s a clue; Coriandrum comes from the Greek word “coris’ meaning ‘bedbug’, because of the similar odour of the leaves. The fresh leaves may be an acquired taste for Western palates but are an essential ingredient in many Southern Asian and Chinese dishes. The leaves quickly loose their flavour with cooking so the practise is to add the leaves right at the end or as a garnish for cooked dishes such as dhal and curries. Coriander seeds are used as a spice, also to flavour curries. Roasting or heating the seeds in a dry pan before grinding releases the nutty flavour, with orange overtones. Chewing the seeds aids digestion and sweetens the breath after eating garlic. Even the roots of coriander are used; mainly in Thai dishes, such as soups and curry pastes. The flavour is deeper and more concentrated than the leaves. The Indian name for coriander is dhanyia while in Mexico and the USA it goes by its Spanish name, cilantro where it is most associated with Mexican salsas and guacamole. 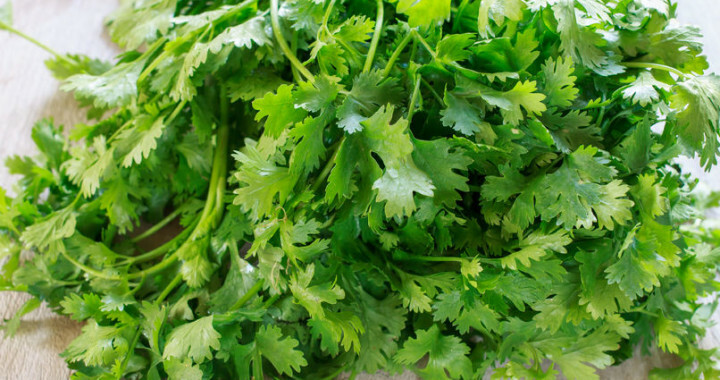 Coriander is grown as an annual, and has feathery leaves that look like Italian parsley. It likes the cooler seasons of spring and autumn, often bolting into flower in midsummer. Plant in full sun, in light, rich soil. Posted in Culinary and tagged coriander, culinary, fresh, herb.